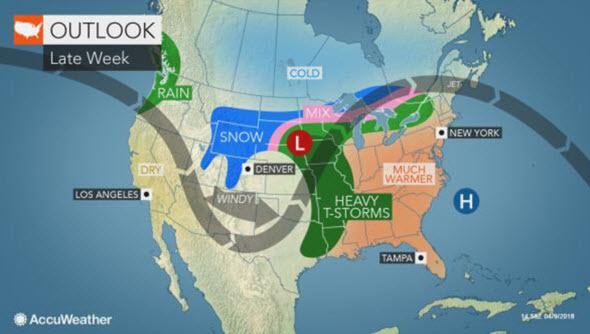 AccuWeather Global Weather Center — April 11, 2018 — A large storm partially responsible for the warmup in much of the East will slowly push across the Midwest this weekend. 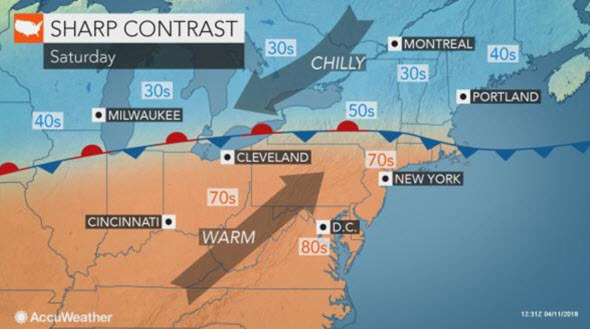 A swath of showers, thunderstorms and severe weather will mark the leading edge of much cooler air. The best bet for outdoor plans this weekend will be on Saturday over much of the region, when temperatures are likely to be at their peak and clouds and rain will remain spotty. Where there is a breeze off the water, the air will remain chilly. 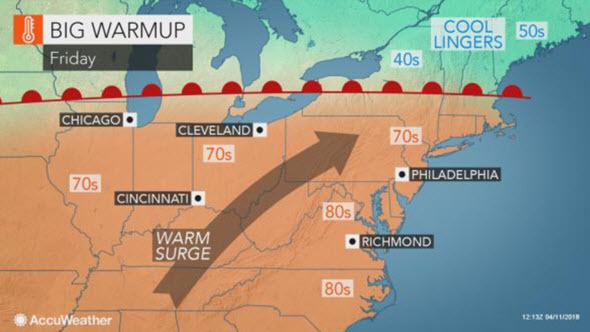 As the chilly air from the north and cooler air from the west converge on the Appalachians and the Atlantic Seaboard, the weather is likely to deteriorate on Sunday in the form of rain and thunderstorms. In the long-range, the warmth will fail to lock in just yet. There will be the risk of frosts and freezes in the pattern, so people should avoid planting tender vegetables and annual flowers just yet, despite the upcoming warm surge. Since the weather has been so cold for so long, soil temperatures are still very low for the middle of April. Seeds planted now may fail to germinate and they will rot. As a result, it may be better to wait a couple more weeks before planting grass.